Birdie and her dog Bowser are going about their lives, working in their grandmother's small shop and looking for any opportunity for a biscuit when things start to happen in their Louisiana town. A businessman from up North, Mr. Kronik, has come to town to set up a call center that will provide a lot of jobs, but his son is attacked by a bull shark while out fishing, and he wants the police to do something. When they refuse (and have the audacity to suggest that perhaps it wasn't a shark), Kronik offers a $50,000 bounty, setting off a wave of shark killings and other trouble. An old acquaintance of Grammy's, Mr. Longstreet, is especially dismayed at the pointless killing of sharks. At this same time, Birdie's cousin Snoozy goes missing. This isn't that unusual, so while they search for him, they figure that he will turn up somewhere. Also, Junior, Nola and Birdie write an original song for a contest, and their band, or rather, Birdie's singing, gets some attention that may have a bad effect on their friendship. Bowser is, of course, very helpful in trying to track down Snoozy and in keeping Birdie safe while she's looking for him. When Snoozy's disappearance seems to be tied to the bounty, will Birdie be able to find him before more trouble occurs? 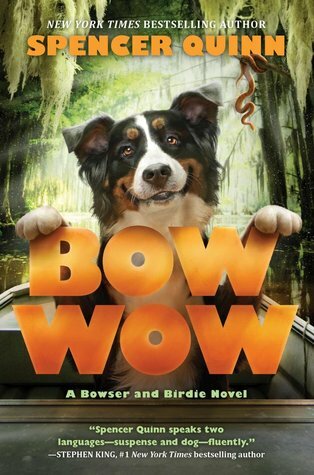 Like Woof and Arf, Bow Wow is a great adventure mystery with a very vivid Southern Bayou setting. The heat, the humidity, and the hundreds of poisonous or dangerous creatures just waiting to strike are enough to keep me on edge without the addition of missing people and fishermen up to no good. I was glad that I could read this on my Midwestern front porch, where the most dangerous insect I encountered was a ladybug! While Birdie's father has passed away, her mother, who is a oil platform engineer, and her grandmother, who runs Gaux Family Fish and Bait are supportive and helpful. They give Birdie enough freedom to travel around solving mysteries with her friends (and loyal dog, of course), and have helped her acquire the skills she needs to do so, like driving boats. Readers who want to spend some time combatting snakes and basking in the humdity can add the Bowser and Birdie books to their reading list along with Spradlin's Killer Species: Menace From the Deep, Wilson's Boys of Blur, Neri's Tru and Nelle series, and the works of Kimberly Griffith Little. Bonus points for locating a funeral home fan to help keep cool while drinking a nice, tall glass of sweet tea! 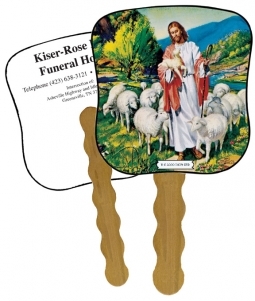 And I started to think I was making up the funeral home fan thing, but I do seem to be remembering that correctly. 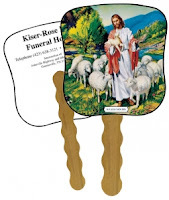 Not that it's a particularly Southern thing, but I was sitting on the porch the other day thinking I needed a fan like they always had in the pews at my Grandmother's church in Pennsylvania!